Live in Washington State and looking for a new mattress? Check out some of our picks for where to buy your new mattress. You spend one third of your life sleeping- or at least you should! Some of you may be tossing and turning in the night and not sleeping in a position or angle that helps you get the energy you need to have a good day. Purchasing a mattress is essential, and can be daunting. If you are wondering “where can I purchase a mattress in Washington State?” then you have found the right spot. Welcome! We combed through mattress stores and some family-run mattress shops to help you find a mattress that fits you. No matter what you budget you deserve a good night’s rest. 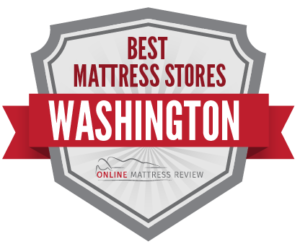 We listed some of the best mattress stores in Washington- mattress shops that offer quality customer service, a wide range of products, and have a no pressure sales team that will ensure that you leave with a mattress that is perfect for your budget. Below are mattress shops listed by city. If you’re looking for a mattress store in Seattle, you have a ton to choose from! We did the work for you and found the mattress shops that were the highest ranked for comfort, convenience, and customer service. Seattle Mattress (6019 15th Ave NW) provides some of the best customer service in town and will price match. They offer a wide selection of mattresses including eco-friendly options that are not treated with chemicals. There’s something for everyone at Seattle Mattress. If you’re in Northern Seattle you could try Bedrooms and More Outlet (1310 N 131st St.). This family-owned business is a great mattress shop that offers quality mattresses for a great price. If you are in need of an affordable mattress, check this place out. When looking for a mattress near Seattle you could try Mattress Ranch (3350 WS State Hwy 16) where you’ll find a knowledgeable staff, eco-friendly mattresses and an affordable product. This is a great option for those living in Port Orchard. Bedrooms & More (300 NE 45th St.) sells quality mattresses without the hassle. If the mattress does not work for you after a few months, an exchange is not a problem. They also have a wide array of mattresses. When searching for a mattress in Olympia we recommend you check out Mattress Ranch (7941 Martin Way E.) where you will find a wide array of mattresses for every type of sleeper. The sales representatives have no problems with you taking your time and trying out each mattress. If you know of a better price elsewhere, Mattress Ranch can match your price. Who could ask for anything more? Struggling with back problems and bank problems? The solution could be NW Sleeps (2727 Westmoor Ct. SW). NW Sleeps is a down-to-earth mattress shop that offers you quality mattresses for a steep discount. The staff are welcoming, friendly, and patient and won’t pressure you into a sale you’re not comfortable with. NW Sleeps sells at wholesale prices. Mattress Firm Tumwater is a great option if you are looking for a mattress near Olympia (5765 Littlerock Rd. SW Tumwater, WA). They stock all of the brand names that you have come to know over the years and will not pressure you to purchase a mattress that doesn’t work with your budget. Oh! And Mattress Firm Tumwater offers financing if needed. If you have ever wondered where to find a mattress in Spokane, try our list! Mattress Firm Spokane (3916 N. Division St.) is a great place to find a mattress that fits. That staff are all extremely knowledgeable about the product and will help you find a mattress that is high quality, and affordable. At Mattress Firm expect clear and consistent delivery policies. Mattress Depot (3104 East Palouse Hwy) has a great selection of mattresses for all types of sleepers. This location is known for its helpful staff, great customer service, and next day delivery. If you are unsure of which mattress is the next best fit for you, try Mattress Depot. Is your budget a little tight? Perhaps you need something fast as you move into your new dormitory. Spokane Overstock (2915 N. Division St.) is a great place to head if you are in need of an affordable mattress fast. The staff knows the product, and in many instances they offer same or next day delivery. Walker’s Furniture and Mattress (15. E. Boone Ave.) is where to head if you are looking for an honest family-run mattress shop. Prices will vary, but the staff are willing to work with you to ensure you find a mattress that fits your budget. If you need to find a mattress store near Kennewick, that’s no problem! There are a number of options directly downtown. Mister Mattress is located near Kennewick (1395 George Washington Way Richland, WA) and offers quality mattresses at affordable prices. The pressure is off when you shop here and the staff truly want to ensure that you leave with a mattress that works for you. Mattress Firm Kennewick (231 Vista Way) is a great option for those looking for the convenience of shopping in town. The staff are knowledgeable and patient. You can take your time trying various beds, and the delivery service is prompt and reliable. Mattress Depot USA (731 N Columbia Center Blvd) offers all of the name brand mattresses you love at a range of prices. No matter what you budget, Mattress Depot USA has something for you.